The world’s longest non-motorized parade! This colorful, exciting Parade is presented each year and keeps the spirit of the first Parade back in 1925. Now known to be the largest Non-Motorized Parade in the country, It still achieves its success through the community’s participation and the dedicated work of its volunteer members. Parking is available near the Rodeo Grounds but is on a first-come basis. Plan to arrive early as grandstand pre-parade entertainment begins at 8AM. The present Parade is being held to 200 entries, with emphasis on quality rather than quantity. In the year 2000, the Tucson Rodeo Parade celebrated it’s 75th year – “Diamond Jubilee”. In 1924, Frederick Leighton Kramer, President of the Arizona Polo Association and later recognized as the Founder of the Tucson Rodeo and Rodeo Parade, gathered a group of local business men to discuss the possibility of having a Rodeo. This group included C. James and Albert H. Condron, President and Secretary of the Chamber of Commerce, respectively. Also Monte Mansfield, a local car dealer, M. H. Starkweather, Architect, “Jack” J.C. Kinny and Bud Parker, local and well respected cattlemen, were present at the meeting. This was the inspiration and moving force that made it possible for the Tucson Rodeo and Tucson Rodeo Parade to take place on February 21, 1925.In “Progressive Arizona – 1925”, Kramer observed, “The City of Tucson excelled itself the day of its first Rodeo Parade called “La Fiesta de los Vaqueros”. The first Parade was led by Major Nuestatter, Tucson’s veteran Parade Leader, followed by the Band of the 25th Infantry from Nogales. Next was the Platoon of the Reserve Officers Unit, Polo Players, cowboys and cowgirls, buggies, wagons, Indians and lastly the Band of the 10th U.S, Cavalry from Ft. Huachuca. 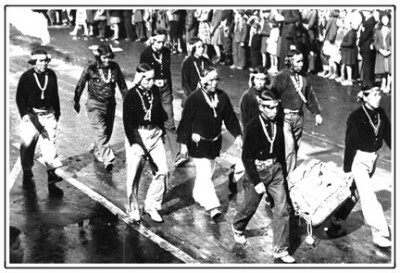 The Parade moved east along the entire length of Congress Street, south on 5th Ave. to Broadway, down Broadway to Stone and North on Stone to E. Alameda Street where the Parade disbanded. Thousands of spectators crowded the Parade route watching more than 300 entries. The present Parade is being held to 200 entries, with emphasis on quality rather than quantity. 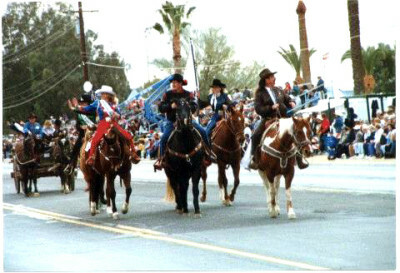 In the year 2000, the Tucson Rodeo Parade celebrated it’s 75th year – “Diamond Jubilee”.